I adore breakfast. But, I’ll be honest. Slaving over a breakfast meal that takes tons of preparation, produces dozens of dirty dishes, and leaves me feeling like I’ll topple over from being too full is for special occasions only. Like every Saturday ? But for the weekdays? I’m definitely more into quick, on-the-go, and healthy breakfast options. 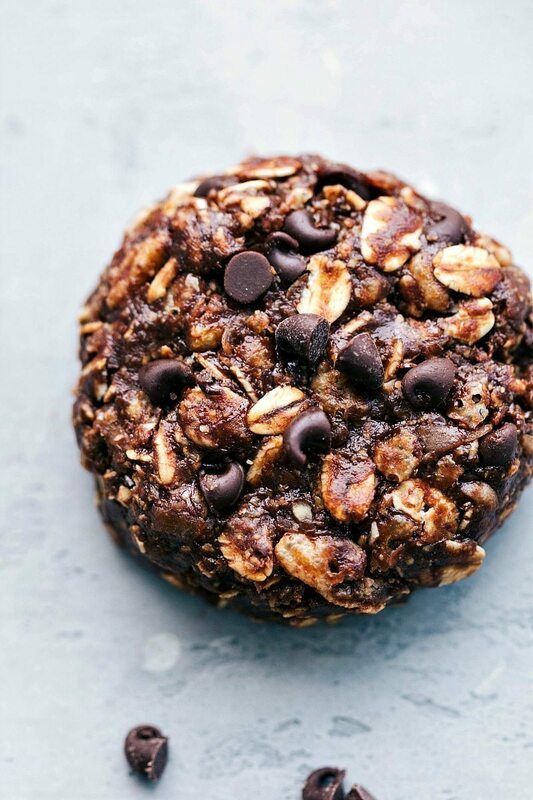 Like healthy banana oat muffins and peanut butter breakfast cookies. Oh, and overnight peanut butter cheesecake oats are a great go-to option around these parts. And these breakfast cookies are no different. They are incredibly simple, completely satisfying, and made with good-for-you ingredients. So you can eat cookies for breakfast. In a medium-sized bowl, combine the almond butter, agave nectar, vanilla, and salt. Microwave for 20-30 seconds and stir until combined. Add in the cocoa powder, oats, coconut, and oat flour (to make oat flour, take regular oats and place them in a blender or food processor and pulse until they resemble flour). Mix to combine. Place in the fridge, covered, for 20 minutes to firm up. Form balls with the mixture and then flatten the balls in your hand to create a cookie shape. Store cookies in an airtight container for 4-5 days (I keep mine in the fridge) or freeze for up to 3 months. 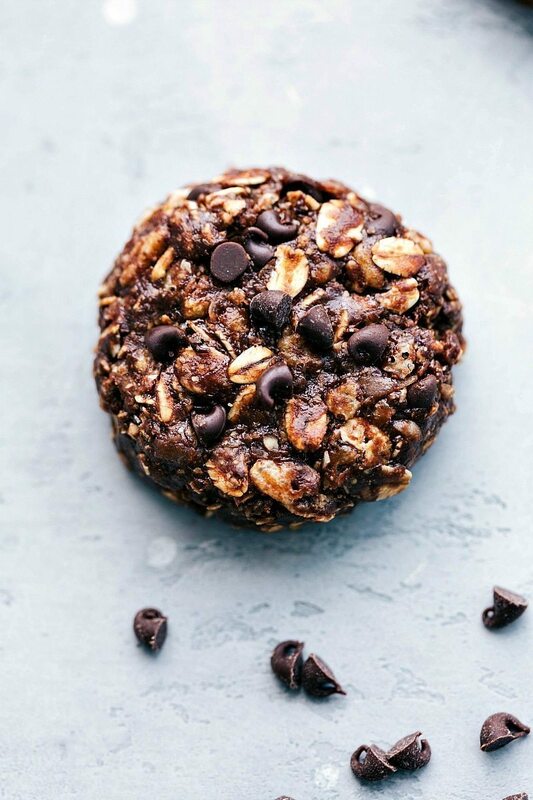 I love the idea of healthy cookies for breakfast!! Maybe I could even stuff some into the.boy who eats breakfast far less often than I’d like! 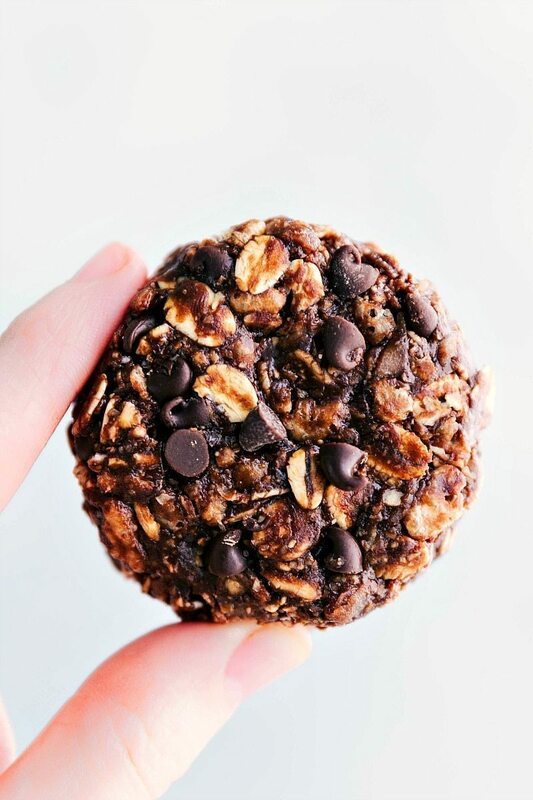 I love me some breakfast cookies….especially when they include the words “double” “chocolate” and “healthy”….and there is peanut butter. Heaven in a cookie girlfriend! Mmmm I could totally get down with these for breakfast! These look delicious, Chelsea! I love the crispy texture addition of the rice krispies! Yum! And the colors in these photos totally make brown food not unappetizing/boring to shoot. Great work! thank you for remembering that I am trying to stay under 300lbs this year lol. I’m always craving sweet carbs in the morning and this looks like the perfect healthy option – love it! I’m definitely an on-the-go type of breakfast person too! 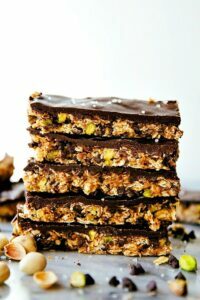 And I love no bake treats, especially ones that look as good as these cookies. Love the colors in the pictures too. The chevron ribbon is so pretty! Cookies for breakfast?? I’m all over it! Especially when they are yummy, healthy and easy!! Pinned. These look AWESOME! I love that they are healthy and still look delicious. 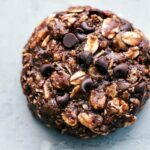 I love the idea of healthy breakfast cookies! What a sweet way to start the day! Thank you for sharing! These look yummy! I need to try this recipe soon. Cookies for breakfast? Count me in! Sorry I’m a little late, but I just linked them up! Thanks for the invite Sara! I really love the no baking! It’s such a quick snack to make. These look amazing!!!! I can’t wait to try them!!! Thanks for sharing! YUM! These look amazing! I pinned them and can’t wait to try them! My daughter and I had great fun making these delicious cookies together. They are so easy and delicious. Thank you for the recipe. I am so glad you enjoyed them. Thanks so much for taking the time to come comment! 🙂 Have a great week! All of these cookies look so yummy! I can’t wait to try them. I’m wondering if anyone has ever tried to add protein powder to them to boost their nutritional value? I’ll be back in a few days to tell you how my cookies turned out – and what my 7 year old thought of them! These look fabulous!!! Just one(maybe two problems) A. I have no Rice Krispies- but I do have Cheerios(the fan isn’t a huge fan of the Krispies- oh well) Could I use a different type of cereal or just all oats? And B. Calorie count? But again they look fabulous! Hi Kate! I’ve never experimented making these with other cereals, but I bet you could just do all oats (I can’t vouch for this though since I haven’t tried it either). The rice krispies give them a nice crunch that I like, so maybe you could crush a few Cheerios down and try that. Why is it that you don’t post the nutrition information with your recipes? It seems completely counter-intuitive to me, to write a bunch of skinny and healthy recipes, and not give that info. Most people looking for this type of thing will want to know! I LOVE your view on healthy eating — in all my years of trying to maintain weight and a healthier lifestyle, I’ve come to the same conclusion 🙂 Moderation in everything! Thank you so much! 🙂 I hope you have a wonderful day! you miss read it. 200 is for one cookie. Hi! I love the sound of these and the cinnamon roll ones also look amazing! However I have a problem, I’m allergic to peanuts! I’m trying to eat more protein but every recipe has peanut butter in it! Is there any thing I could substitute instead? Have you tried sunbutter? I’m not sure how it will taste since I haven’t tried it, but I do know that’s high in protein!